Sometimes the best medicine to a hangover/bad day/breakup is just hanging with the one you know won’t wake up one day and tell you they don’t love you anymore—your dog. Lucky for us, Sunny Coasters are generally pretty cruisy when it comes to taking your little buddy along to just about everywhere (but don’t forget the poop bag). Check out our roundup of the best dog-friendly spots on the Sunshine Coast, knowing your four-legged pal will be accepted, patted, and ogled over by fellow crazy dog people. Ultimate beach views, sea breezes, a burger, a milkshake, and your little hound by your side. Does it get much better? The surf club’s resident café, The Kiosk is sitting on one of the most enviable locations across the Coast—so close to the beach in fact, you and your pet could go for a dip while you wait for your number to be called! The Kiosk is open from 7am to 2pm daily, so it’s perfect for a Sunday morning stroll and brekkie—salty hair and wet bums welcome. Tucked just behind the hustle of the esplanade is Mooloolaba’s own little dog-friendly haven—a place where you both can have a Saturday morning cappuccino (or a puppacino in the case of your little mate). 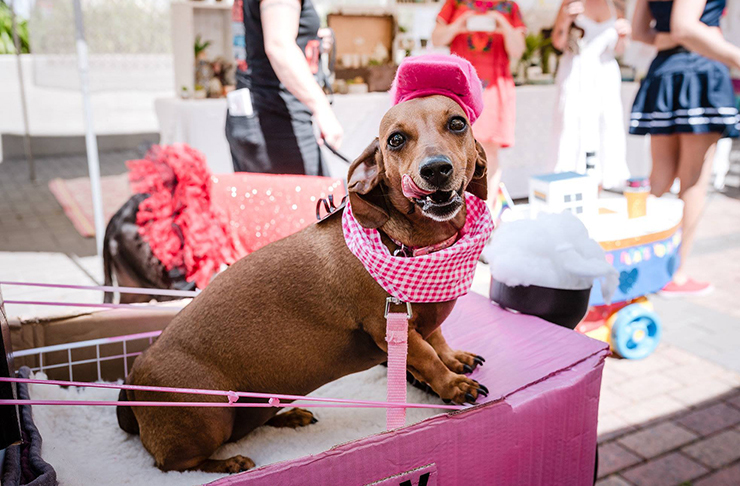 The Velo Project are self-confessed dog lovers and will make sure your littlest love is well tended to during your visit—so much so they’ve even designed a “Dogue Menu” with a range of doggy delights. Lactose-free peanut butter shake, anyone? The fact that this gorgeous hinterland café allows dogs in its outside eatery area AND has amazing grub means its European charm is twice as nice. The beautiful French style cafeteria faces both outwards over the hinterland and inwards toward the bustling but quaint streets of Montville. Pull up a deck chair under one of Poets Cafe many sun umbrellas, order a Riesling, and enjoy the view. The perfect spot for a summer family lunch or a drizzly day on your lonesome—the hinterland is always beautiful. If your pup doesn’t mind busy crowds, the occasional pat from strangers and a few meet and greets with other pooches, the Eumundi Markets are the ideal way to spend a Saturday morning. Even better if your pup enjoys potato slinkies, cronuts, and dumplings as much as you do. Go early if you want to beat the crowds and make sure you pack a water bottle for when the mid-morning heat hits. This little strip of white sand, backing onto the Noosa Spit (riverside of Claude Batten Drive) is the dog lover’s dream come true. Even if you don’t own one, head down here to watch other people’s hounds run through the park and steal Brazilian tourists’ hot lunch from their hands (it happens, trust us). Bonus points for this one because it’s an off-leash area, but pack a lead just in case you arrive at peak hour and need a speedy exit. The Sunshine Coast’s very own take on the Whitsundays’ crystal blue water and white sand, Lake Currimundi and the Currimundi Beach strip are a full day out for you and the pooch. Enter at the exit adjacent to corner of Robe and Watson Street, where dogs are permitted off-leash at all times. Be sure to pack plenty of water for your furry companion—on a hot day the nearest doggy water tap may be ten minutes away. We also recommend a good book, a cute throw rug, and a Frisbee—to keep your tailwagger entertained while you try to relax. If your postcode falls into the northern end of the Coast, there’s a good chance you’ve heard of Stumers Creek, the trendy beach hang out for pet parents from in and around Coolum. This dedicated doggy beach begins at exit 69 on the Coolum foreshore (just past the Coolum township headed north of David Low Way) and has plenty of room for walking, ball throwing, and wading in the shallow protected inlet. Be mindful, parks can be hard to snag and the sand is usually SWARMING with off-leash hounds, so this one’s better for more social breeds. Think marina views, lots of shade, and plenty of room for puppies who want to get wet, but don’t love the waves. The reserve boasts an awesome walk up to the lighthouse that will tire out your little mate, as well as work your tooshie. Grab a coffee on your way up at One on La Balsa and you’ve managed to combine date afternoon + workout + dog. Nice one! Turn your doggy day trip into a weekender with an overnight camp at Borumba Deer Park. Stowed away in the Sunshine Coast hinterland is the picturesque Deer Park, where pets are welcome and a night in the swag will cost you all of $13. The park hires out boats, kayaks, and fishing supplies so if your pup likes an adventure (or has good balance) it’s the perfect alternative to a night away in a hotel and a pet resort. This one’s an awesome choice for an Australia Day getaway. Dubbed the Coast’s ultimate dog park destination, this one’s a real treat for your canine, particularly if your mutt is of the smaller variety because of it’s fenced off small pup play area. The Buderim Dog Park is located on the corner of Mooloolaba Road and Syd Lingard Drive just off the motorway and is the perfect place for a puppy play date and picnic with your likeminded pals. Pack some pasta salad and let the little ones play while you take a seat under the undercover gazebos. Own a sausage dog? Even better. The Sausage Dog Squad have a meeting in the park on the last Sunday of the month between 2pm and 4pm, so bring your baby snag along for a social outing. The Petrie Park nature walk is packed with footbridges, shaded walkways, and bushland ready to be sniffed at and explored by your pooch. The park has an off-leash open play area, as well as a winding nature walk which allows dogs on leashes at all times. For those sanga and Schmackos breaks, there’s picnic tables scattered throughout. Want more puppy hangs? We've also rounded up The Best Sunshine Coast Cafes To Take Your Dog here. Love camping with your pupper? The Best Dog-Friendly Camping Spots On And Around the Sunshine Coast.